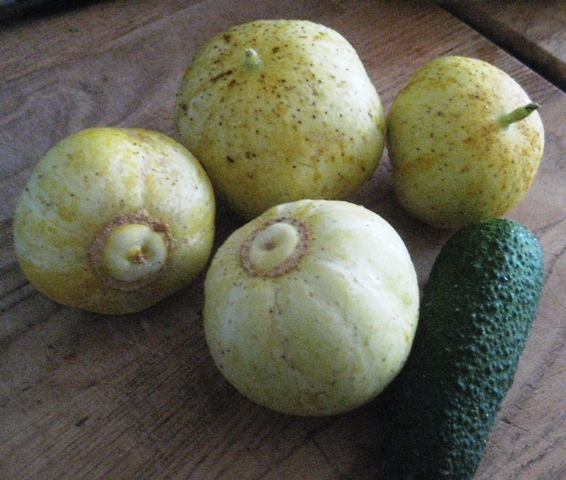 Lemon cucumbers and one gherkin cucumber from our garden. 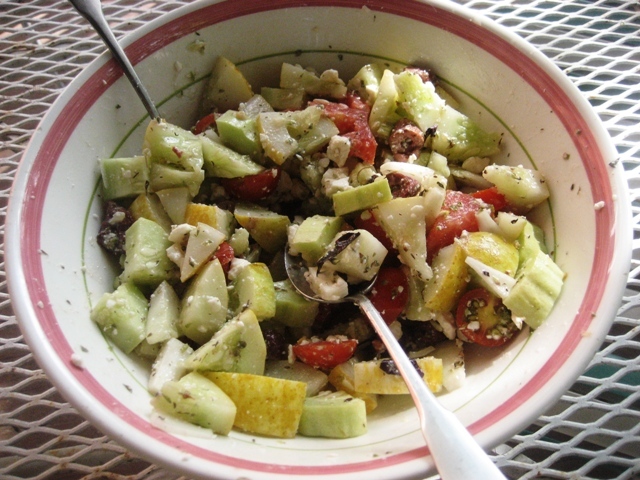 I was lucky enough to travel to Greece with my family when I was a teenager and since then, Greek salad (I think they just call it salad there) has been one of my favorite ways to enjoy cucumbers. These lemon cucumbers from our garden add a lot of bright color to this crisp summer salad. The lemon cukes are named for their appearance, inside they look and taste like the cucumbers you are used to. Their skin is thinner than traditional cucumbers which is why you don’t see them in grocery stores, they need to be eaten or preserved with in about 48 hours of picking them! 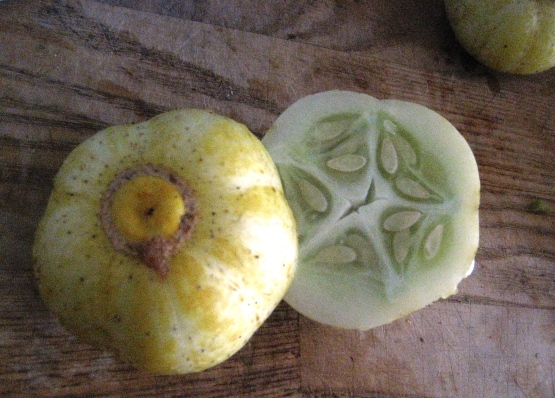 Sliced lemon cucumber, slightly green and familiar insides. Assemble the salad and toss just before serving. Prep all of your veggies, the amounts are not super important, if you want mostly cucumbers, go for it. Or use an even amount of each, it’s salad, not rocket science, use what you’ve got, it’ll be good! Sprinkle equal amounts of the herbs over the top of your mixed veggies. Add salt and pepper and as many olives as you like. Drizzle olive oil, you won’t need much, toss to coat and then add half as much vinegar, toss again. 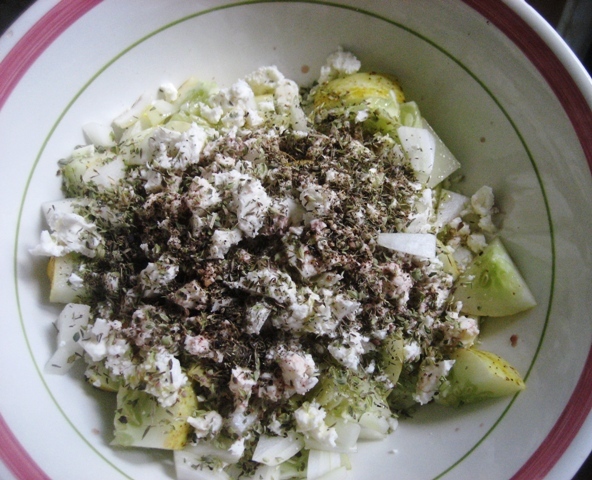 Crumble enough feta cheese to cover the top of your salad. I would suggest that you be generous with your servings of this salad. Feta cheese is naturally low in calories compared to other cheeses. Cucumbers are a more nutrient dense form of water and the amount of olive oil needed in this recipe is relatively low. What I am saying here is that this dish is high in nutrients, large in size and low in calories. A colorful way to enjoy the fresh veggies of late summer. Lately I’ve been able to eat as many green vegetables as my heart desires as they are growing freely in our garden. I’ve been eating huge dinner plates full of collards and kale and lettuces, several times a day. And they make me feel full. Why? They are highly nutritious and thus feeding the cells of my body that which they need to function optimally. And my stomach is literally full of food. Food that contains fiber and fat, which will take me a while to digest, thus I am full for hours. Conclusion: eat more nutrient dense foods more often! So may times I’ve been asked, how can I eat such a restricted diet? No one seems to understand: I eat a diet restricted to the foods that make me feel energized, satiated, happy and healthy, most of the time. Everything in moderation, including moderation. We shouldn’t all eat everything all the time just because it’s available and conveniently wrapped in non recyclable garbage with a far off expiration date on it. Seriously, have you seen these?! A healthy diet is one that contains the foods that make you feel your best and limits everything else to the occasional indulgence. Sure, you have to do some research (aka paying attention to what you eat and how it makes you feel) and then you’ll have to eliminate some foods and add in new foods. It’s worth the effort. It’s pretty amazing how far you can go on a “restricted” diet!